CloudBox: APIs Managed, all in one place. With our TechHub CloudBox-API platform you are able to access the best and mostly used API’s in one place. AWS, Google, Twitter, Facebook, Dropbox and multiple other resources: manage usage, keep track of data and users, design your specific metrics around the use case and solution deployed against the CouldBox API. Never worry about various resources again, integrate against a unified API set – we will take care of the rest. Creating your own business or service API is challenging. The TechHub API development services ensure the right architecture decisions, design and set-up for your API. Ask us how your API can mean serious business. Storage, the use of NoSQL and Big Data analytics are drivers of future eBusiness. Accessing and maintaining vast amounts of storage delivered to you as a service is the key for the execution ability in your line of business. Connecting with various available solution API’s will simplify the way you run your enterprise solutions. Deploying standardized solutions for CRM, Sales and other areas of business will make you more cost-effective, flexible and will drive usage and conversion. Allow your Business API to expose services towards 3rd Parties in a standardized, secure way for partners and developers: TechHub provides you with API portal development, API standards and security implementations, the configuration and optimization of your online API Docs (I/O Docs), Beta-Roll-out and Roll-out of your Business API. In order for you to leverage on your business services by offering API’s to third parties you will require reliable, scalable and future-proof solutions for the deployed API. TechHub Systems specializes in the setup and deployment of sustainable API’s. In the new world of connected eBusiness the reliability, security and ability to sustain services is mission-critical. TechHub Europe can help you build, secure and scale fail proof solutions for connected business. Apple entered the market for home automation a year ago with its announcement of HomeKit. With the HomeKit SDK management of connected home devices became simple and reliable. Control Lights, Heating, entry control, etc. – every scenario seems possible. When it comes to overall management of services in a enterprise context a cloud based platform and API to structure connected devices is required. TechHub has developed such a HomeKit API and cloud solution and can offer you a certified solution to enable the integration with and management of devices under HomeKit. For hardware manufacturers in Home Automation and Connected Home this solution bridges the gap between HomeKit and proprietary systems. Integrate with HomeKit and access the vast market for home automation products. Global Stocks and Securities, US Stocks, International Markets, NASDAQ, IPO’s, Corporate Financial Data, Last-Sale, Trading, ETF’s, Bonds: An overview of all Finacial Market Data API’s can be found on our dedicated Financial Data page. If you are looking for Financial Data from around the Globe, than TechHub Global Finance API’s are the answer. Data delivered in Real-Time or with 15 Min. delay, historic Last-Sale or data for financial analysis: For each Market category you’ll find a highly available sourcing API. TechHub geoServer technology integrates with what3words technologies and can identify and pinpoint any location globally at a 3×3 mtr precision level, without requiring address data for the location. Delivery of goods or services at the precise location is of eminent importance in logistics and services. Besides many complex address systems that may not be easily decoded to exact locations, approximately 75% of the worlds population lives on locations that are not represented by address data. Via what3words technology these locations can be identified and precisely pin pointed. Every 3×3 square meter area of the globe can be identified and addressed in logistics and other scenarios using what3words technology. Over 500.000 Datasets for consumer packaged goods and products. Entire datasets including UPC, EAN-13, product name, manufacturer, brand name, sizing, industrial categories and average pricing. Use over 150.000 data sets of food products and beverages and complete ingredients data-sets for over 300.000 consumer packaged goods. Retrieve all product information via simple UPC-Serach or via the extremely powerful full-text search, which allows highly granular search filtering and filtering by product or ingredient popularity. 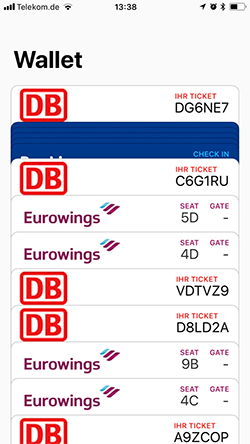 Our Wallet & Boarding Pass API is a managed service provided by TechHubEU enabling complete flexibility in the creation and distribution of payment cards, boarding passes, tickets, gift cards, and other passes. Participating Parties have full control over the branding, configuration and information management of online and mobile passes using their own app development team or agency. The API integrates into the supplier systems, streamlining existing business processes and mobile strategies.